How many people can say they’ve walked over an active volcano? Trading blood, sweat and fear for accomplishment and sheer ecstasy seemed like a good deal to me. Ascending into cloud-infused mountains with the morning sun beaming on my face, the looming shadow of the summit escapes from the kiss of the sun. It’s a well-travelled path, some conquered and some consumed by the raging beast –right now I think I’m experiencing both. Eight hours earlier, we started on our mission to reach Indonesia’s second highest volcano, standing unforgivingly at 3,726 metres. Our three porters, dressed in shorts, white three-quarter tops, socks and thongs manoeuver up Rinjani cleverly. They know the mountain well, like an old friend. Up ahead, our porters lower the soft brown bamboo basket to the ground, an unspoken sign our next break is near. We stop for a liberal scoop of rice, fried chicken leg and green vegetables. The tangy coriander blends with the sweet coconut to tickle my taste buds and settle my stomach. Devouring the meal, I laugh at the irony of this carefully planned meal, a contrast of what you normally expect when camping. After a blissful 15 minutes, Darma, the youngest of our porters, prompts us to proceed. We proceed, consuming one bite of Rinjani at a time. Walking along, my body still teased from the break, I ask Darma how long until we reach the crater rim. “About 90 minutes mam,” he said with ease. Trying to remain positive against the battle of my heavy legs and sounding like a city-dweller, I feed my spirit with the luscious views. The calm and cold ambience is strangely soothing – the only sound of footsteps and wind. 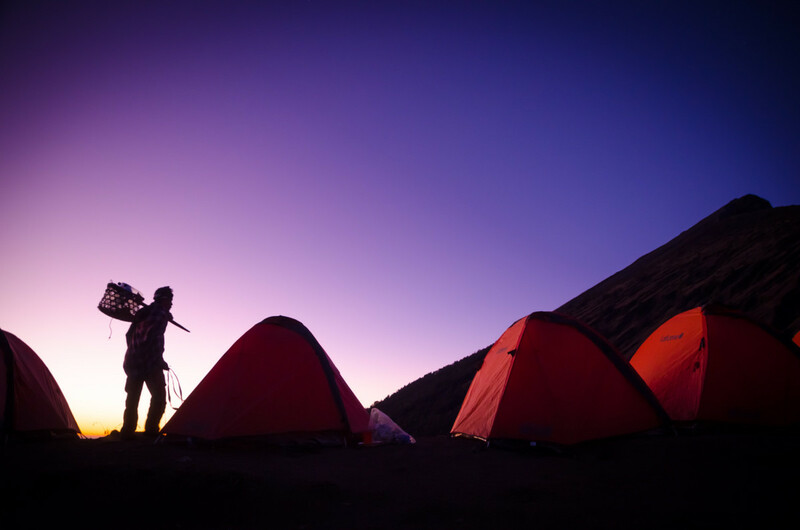 We reach the crater rim by sunset and my body collapses onto the ground, part from exhaustion and part from the beauty of Rinjani behind the descending orange sun. Among the twenty-so hikers who have reached the rim, there is a sense of harmony. Little words are spoken, with all of our attention fixated on the silhouette in the distance. I ravish another heavenly serve of meat and rice before my sore feat guide me to my tent. The morning sun wakes me naturally. “Let’s go!” one of our porters encourages. My feet still sore from yesterday, Darma is regularly stopping to check up on me. The trail morphs into a much steeper path leading up to the lake. The sun rises higher and the day is steep and slow. Passing through endless meadows and walking carefully on unstable rocks, suddenly a crystal blue lake emerges from behind a hill. Reaching the lake I see other hikers refreshed with wet hair and our porters have set up a place for us eat close to the water. Plunging into the 30 degree hot springs with the cool air breeze on my face, I know this overwhelming feeling to get here is all worth it.